Why not pay for something real this time? 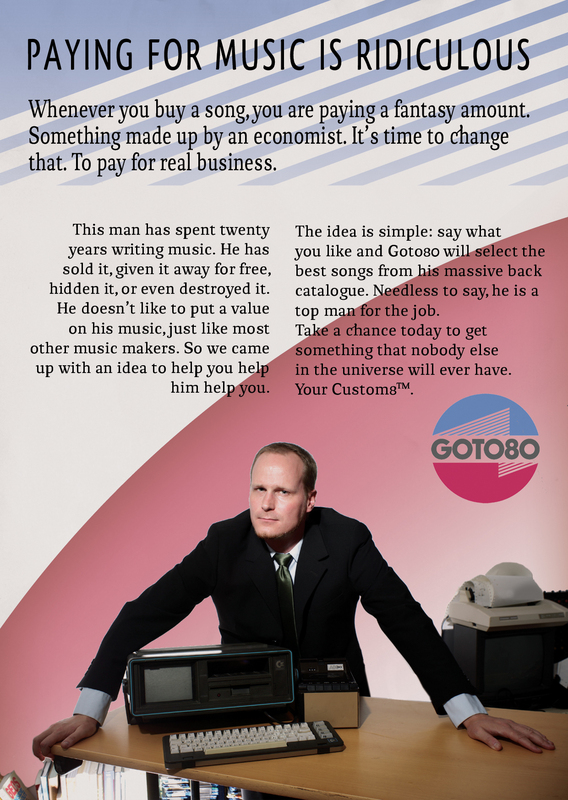 Custom8™ is a revolutionary service brought to you by the swedish lo-fi visionary Goto80. The idea is simple, describe what kind of songs you would like, and Goto80 scans through his 20-year back catalogue to find the right songs for you. He can offset anything from dark noise to ultra cute pop, from slow drones to frenetic breakrock, ogg jazz grooves to pounding techno. Fill in the form and paypal 30 euros to info@goto80.com. You will receive an e-mail with a link to download your custom release, normally within a week. 30-300 minutes of MP3-files that might (not) have been released before, as Goto80 or not. This is where you receive the music. If you don't use paypal or have any questions, get in touch with support services at fax@goto80.com. Please consult your nearest police station to handle the songs in accordance with local copyright legislation. Design: C-men, Photo: OJD, Code: kaneel.